Respected cosmetic dentist, Dr. Dan Myers, now welcomes new patients with missing teeth in Sandy Springs, GA, and the Alpharetta area for custom dental implant placement and restorations, with or without a referral. Dr. Myers is a skilled cosmetic dentist who has been offering dental implant placement and restorations for the last 20 years. Patients with missing teeth in Sandy Springs, GA, Alpharetta, GA, and surrounding areas can now receive custom dental implants from Dr. Dan Myers at THE DENTIST Centers without a referral. Dr. Myers is a skilled cosmetic dentist who has been offering dental implant placement and restorations for the last 20 years. He now offers skilled dental care in two practice locations THE DENTIST Windward Parkway Center and THE DENTIST. Sandy Springs Center. Dental implants are used to replace missing teeth. Instead of being placed on top of the gums or anchored to adjacent teeth like dental bridges or dentures, implants are surgically inserted directly into the jaw bone. Once the post of each implant is successfully placed in the jaw, the area is allowed to heal for a period of time. During the healing period, the bone of the jaw grows around the implant and holds it firmly in place during a process called osseointegration. After osseointegration, Dr. Myers crafts and attaches a custom crown to the implant post. The crown restores both the aesthetic appearance and the function of the smile. Due to the long-term reliability and natural appearance of implants, Dr. Myers recommends them to all eligible patients with missing teeth in the Sandy Springs and Alpharetta areas. Dr. Myers regularly places and restores implants in-office for his patients’ convenience. He offers computer-guided dental implant surgery to deliver the most precise placement and lasting results. Cone beam CT scans and leading software are used in guided dental implant surgery to achieve the most positive treatment outcome possible. In addition to offering precise implant placement, Dr. Myers also offers tooth extractions and bone grafting procedures in-office for patients who require them before they can receive implants. Patients with missing teeth in Sandy Springs, GA, are encouraged to find out if they’re good candidates for dental implants. Individuals can schedule consultations with Dr. Myers by calling THE DENTIST. Sandy Springs Center at 404-382-5798. Dr. Dan Myers is a cosmetic dentist serving his Alpharetta, GA and Sandy Springs, GA communities with modern and comfortable care. After dental school, Dr. Myers had the honor of training with some of the most prominent -cosmetic dentists in the industry where he gained exclusive knowledge and superior artistry skills in esthetic dental reconstruction. 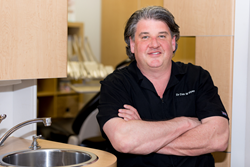 He continuously participates in numerous continuing education courses in dental esthetics, including the prestigious Las Vegas Institute for Advanced Dental Studies (LVI). Among other services, Dr. Myers offers dental implants, dental crowns and bridges, porcelain veneers and orthodontics. He also provides custom facial esthetics treatments including Botox® and dermal fillers. Dr. Myers’ passion for the art of dentistry guides him in transforming countless smiles and providing comprehensive dental care for the entire family in a stress-free dental environment. To learn more about Dr. Myers, his team or the services he offers visit http://www.thedentistcenters.com or call 678-825-6805 for THE DENTIST Windward Parkway Center or 404-382-5798 for THE DENTIST. Sandy Springs Center.